William Fletcher Wheeler (1824-1894) – A U.S. Marshal in Montana Territory, Wheeler was the son of a Methodist minister, born at Warwick, New York on July 6,1824. Though the family moved around alot during his childhood, Wheeler received a good education and in 1843 became an apprentice for the Ohio Statesman as a printer and reporter under Samuel Medary. He remained in that position for three years, studying law in his spare time, and in 1848 was admitted to practice in front of the bar. Wheeler moved to St. Paul, Minnesota in 1856, and in 1857 he accepted an appointment as Territorial Librarian and private secretary to Samuel Medary, who by then was Territorial Governor of Minnesota. 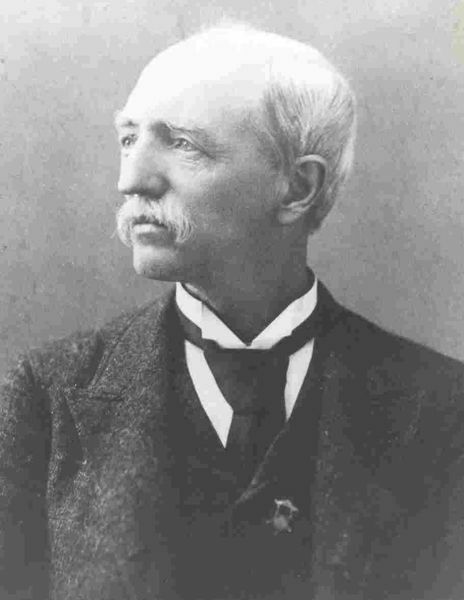 Wheeler was continued in this position under Governor Sibley, the first state governor. Sibley commissioned Wheeler as a Lieutenant Colonel of the First Minnesota Voluntary Infantry in 1858. In the Spring of 1860, Wheeler projected and located the first telegraph line in Minnesota and incorporated a rail line from Duluth to St. Paul. At the outbreak of the Civil War, Wheeler assisted in raising a company of volunteers which became part of the Fourth Minnesota Regiment, stationed at Fort Snelling. As the war progressed, he saw action at Cornith, Iuka, and Vicksburg. On the drive towards Chattanooga, Wheeler became severely ill and was discharged in the Spring of 1864. After President Grant’s inauguration, Wheeler was appointed as United States Marshal of Montana Territory on May 15, 1869, succeeding Neil Howie. In 1870, as Marshal, Wheeler wrote an extensive account of the Piegan War and coordinated the taking of the U.S. Census in Montana. Marshal Wheeler was also assigned as Superintendent of the United States Penitentiary at Deer lodge in 1871. This duty consumed a great deal of time, as the prison had to be constructed from the ground up. Wheeler retained the office Montana U.S. Marshal until 1878, when Alexander C. Botkin replaced him. Through the efforts of Wheeler and other early Montana settlers, the Montana Historical Society was formed; and in 1884 he was appointed it’s librarian when the society became a state institution, a position he held until his death. He devoted much of his time collecting the reminiscences of old pioneers and writing their biographies. Wheeler was also the Crier of the United States District Court at Helena. He died at his home in Helena on June 24, 1894 due to heart and lung trouble which developed from pneumonia.